It’s the middle of the night, from here you can’t even see the lights of the city. I go out on to the balcony and look up at the unusually clear sky: a black cloak studded with billions of stars and the full moon illuminating everything like a searchlight. I think of Space Age intergalactic heroines, the ones in the vintage comic book stories I collect and keep on my bookcase, the ones illustrated by Lawrence Sterne Stevens and M.C. Wolfman. Courageous, fearless women who launch themselves into adventures in hyperspace, going beyond every imaginable limit and projecting themselves into an unreachable future, still unknown to us. A gust of wind brings me back to reality, and when I return indoors closing the window, I think I can see a new spark in the sky… Maybe there really is a courageous woman up there, exploring new planets on board her star ship. 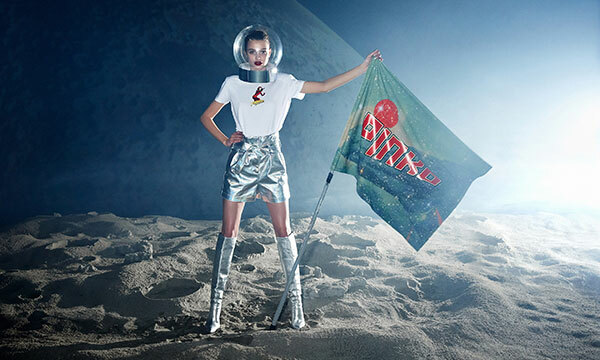 I slip into my oversize sweatshirt, it says PINKO SPACE PROGRAM and deep down, I feel a little like a courageous heroine: ready to land on the Moon, just like Neil Armstrong 50 years ago.